Everything in this video is free, open, and sharable content. We are on the cusp of a global revolution in teaching and learning. Educators worldwide are. 4 Everything in this video is free, open, and sharable content. Wikibooks is creating a free collection of open content textbooks, including a collection for young children. 6 Everything in this video is free, open, and sharable content. In the commons, whatever you give away, you still have for yourself. 7 At the heart of the movement toward Open Educational Resources is the simple and powerful idea that the worlds knowledge is a public good and that technology … provide[s] an extraordinary opportunity for everyone to share, use, and re-use knowledge. The William and Flora Hewlett Foundation Everything in this video is free, open, and sharable content. 8 Were turning the digital divide into digital dividends using free content and open networks. We hope you will join us. - WikiEducator WikiEducators mission is to produce a free version of the educational curriculum by 2015. 9 Everything in this video is free, open, and sharable content. Wikimedia Commons has 2,169,849 freely usable media files (probably more by the time you read this). 10 Everything in this video is free, open, and sharable content. You can be a part of this exciting movement by licensing your content with a Creative Commons license or by uploading to an OER site. Sharing is good! 11 Everything in this video is free, open, and sharable content. Flickr gives you an easy option to make your photos open and sharable under a Creative Commons license. 12 Everything in this video is free, open, and sharable content. The content from more than 1700 courses from MIT are freely available on the web. These courses are accessed by lifelong learners all around the world. 13 Everything in this video is free, open, and sharable content. Education should be free for everyone. 15 Everything in this video is free, open, and sharable content. 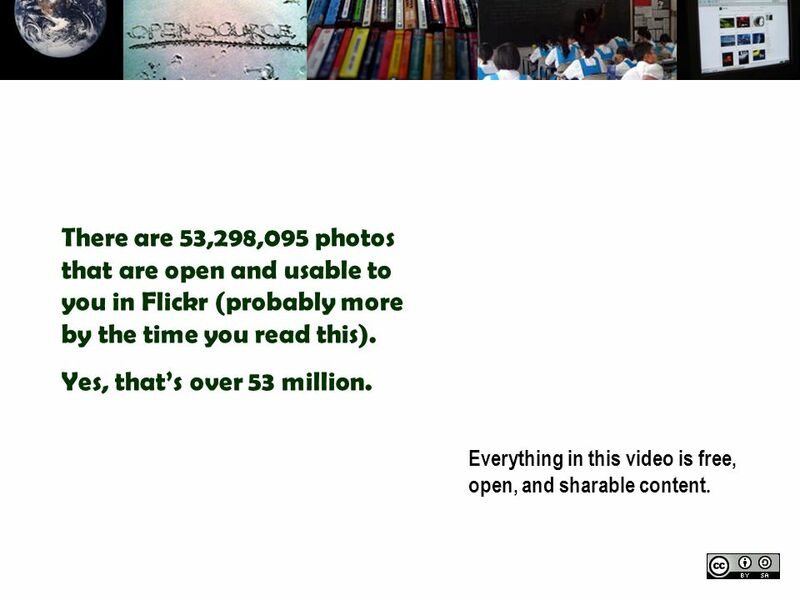 There are 53,298,095 photos that are open and usable to you in Flickr (probably more by the time you read this). Yes, thats over 53 million. 16 Everything in this video is free, open, and sharable content. You can be a part of this exciting movement by licensing your content with a Creative Commons license or by uploading to an OER site. Sharing is good! 18 Everything in this video is free, open, and sharable content. FreeReading is an open collection of research- based tools for early literacy teachers. The Florida Instructional Materials Adoption Committee for K-3 Supplemental Reading Programs has officially adopted this resource. 19 Everything in this video is free, open, and sharable content. Wikibooks is creating a free collection of open content textbooks, including a collection for young children. 21 Everything in this video is free, open, and sharable content. In the commons, whatever you give away, you still have for yourself. 22 OER are the parts of that knowledge that comprise the fundamental components of education – content and tools for teaching, learning and research. The William and Flora Hewlett Foundation Everything in this video is free, open, and sharable content. 24 Everything in this video is free, open, and sharable content. Were turning the digital divide into digital dividends using free content and open networks. We hope you will join us. - WikiEducator WikiEducators mission is to produce a free version of the educational curriculum by 2015. 25 Everything in this video is free, open, and sharable content. Wikimedia Commons has 2,169,849 freely usable media files (probably more by the time you read this). 26 Everything in this video is free, open, and sharable content. You can be a part of this exciting movement by licensing your content with a Creative Commons license or by uploading to an OER site. Sharing is good! 27 Everything in this video is free, open, and sharable content. Flickr gives you an easy option to make your photos open and sharable under a Creative Commons license. 29 Everything in this video is free, open, and sharable content. The content from more than 1700 courses from MIT are freely available on the web. These courses are accessed by lifelong learners all around the world. 30 Everything in this video is free, open, and sharable content. In the commons, whatever you give away, you still have for yourself. 32 Everything in this video is free, open, and sharable content. Curriki is a site for K-12 Open Source Curriculum to which anyone can contribute. 33 Everything in this video is free, open, and sharable content. Education should be free for everyone. 34 Everything in this video is free, open, and sharable content. There are 53,298,095 photos that are open and usable to you in Flickr (probably more by the time you read this). Yes, thats over 53 million. 35 Everything in this video is free, open, and sharable content. OER Commons is a large collection of open educational resources. It uses tags, ratings, comments, reviews, and social networking to create an online experience that engages educators in sharing their best teaching and learning practices. 36 Everything in this video is free, open, and sharable content. 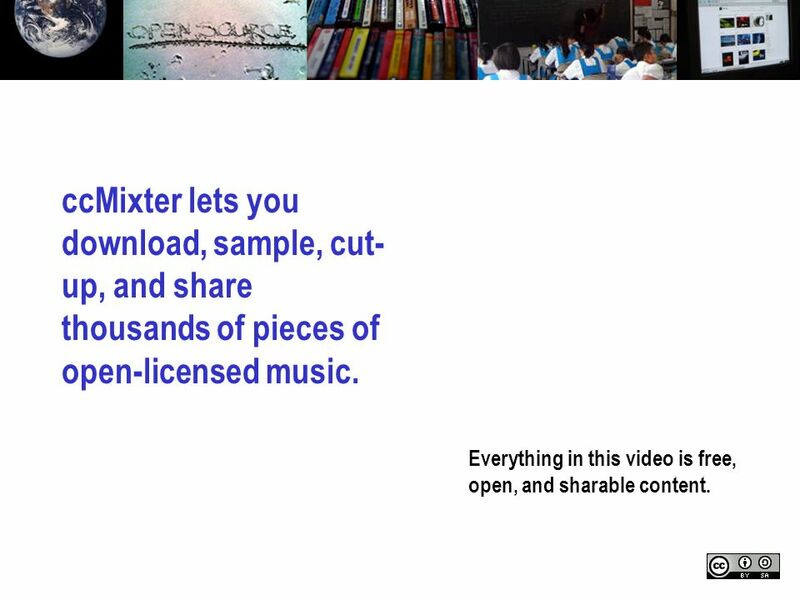 ccMixter lets you download, sample, cut- up, and share thousands of pieces of open-licensed music. 37 Everything in this video is free, open, and sharable content. You can be a part of this exciting movement by licensing your content with a Creative Commons license or by uploading to an OER site. Sharing is good! 39 Everything in this video is free, open, and sharable content. Education should be free for everyone. 40 Everything in this video is free, open, and sharable content. There are 53,298,095 photos that are open and usable to you in Flickr (probably more by the time you read this). Yes, thats over 53 million. 41 Everything in this video is free, open, and sharable content. OER Commons is a large collection of open educational resources. It uses tags, ratings, comments, reviews, and social networking to create an online experience that engages educators in sharing their best teaching and learning practices. 42 Everything in this video is free, open, and sharable content. Flickr gives you an easy option to make your photos open and sharable under a Creative Commons license. 43 Everything in this video is free, open, and sharable content. The content from more than 1700 courses from MIT are freely available on the web. These courses are accessed by lifelong learners all around the world. 44 Everything in this video is free, open, and sharable content. In the commons, whatever you give away, you still have for yourself. 45 Everything in this video is free, open, and sharable content. FreeReading is an open collection of instructional resources to teach early reading. It has been adopted by the state of Florida. 46 Everything in this video is free, open, and sharable content. You can be a part of this exciting movement by licensing your content with a Creative Commons license or by uploading to an OER site. Sharing is good! 47 Everything in this video is free, open, and sharable content. Curriki is a site for K-12 Open Source Curriculum to which anyone can contribute. 49 Everything in this video is free, open, and sharable content. You can be a part of this exciting movement by licensing your content with a Creative Commons license or by uploading to one of these sites. Sharing is good! Download ppt "Everything in this video is free, open, and sharable content. We are on the cusp of a global revolution in teaching and learning. Educators worldwide are." 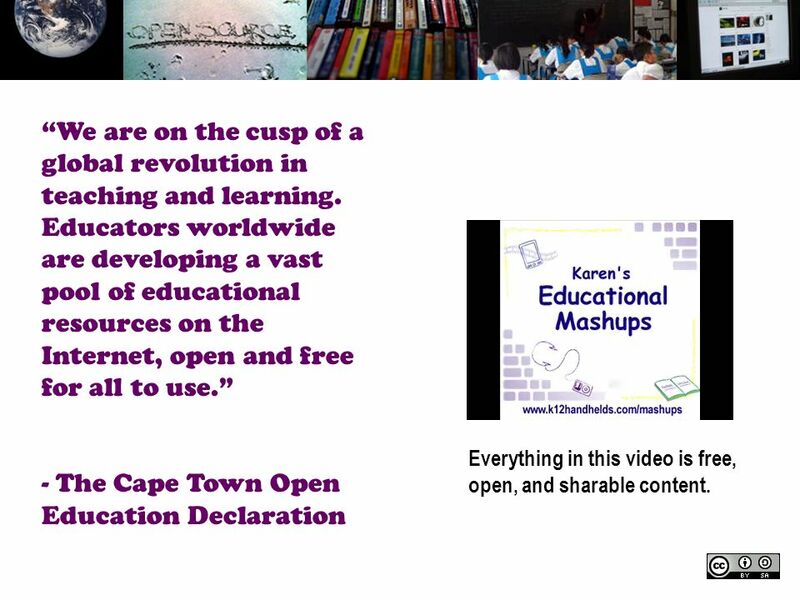 Free Content + Open Tools + Mass Collaboration = Learning for All. Better universities with free content: the future of open educational resources Jan Hylén. C U L. OER definitions “... digitised materials offered freely and openly for educators, students and self-learners to use and. Open Educational Resources- a short guide With thanks to the Unicycle project. Curricular Reform and ICT Integration Richard R. Rowe, Ph.D., Open Learning Exchange International The Role of ICT4E Policy in Education Transformation. EFQUEL 2008 Forum, June 2008, Lisbon 1 Learning2.0 Kirsti Ala-Mutka, Christine Redecker & Yves Punie European Commission, JRC Institute for Prospective. Impact Learning with Web 2.0 Tools We teach digital natives…..
Media 4 teachers.org Sue Maunders and Hiro Sasaki Final Group Project: Business Development II EDUC 391 December 5, 2007. Open Educational Resources / production workshop / february 2009 Except where otherwise noted, this work is available under a Creative Commons Attribution. Open Educational Resources Brazil December 2008. Blogs  Also known as a web log  A tool for collaboration in a in the 21 st century classroom  Allows one to share ideas and thoughts with the world. The OpenLearn Project Professor David Vincent President, European Association of Distance Teaching Universities Pro-Vice Chancellor, The Open University. Open.michigan we want to work with you. garin fons pieter kleymeer greg grossmeier guest presentation Susan Kornfield’s Advanced Copyright Practice University. Defining concepts in online and open education Darco Jansen SEQUENT Consultation Session, Slovenia, 9 March2015.